Panchayat Department. Apply online for HPSC BDPO Recruitment HCS Prelims Exam 2018 through official website of www.hpsconline.in. Candidates selection is based on Prelims Exam, Mains Exam and Interview. 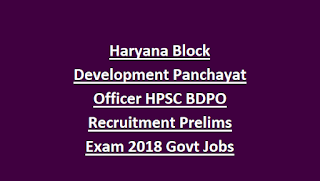 Haryana HPSC BDPO Block Development Panchayat Officer posts Exam Pattern and Exam Syllabus for HCS Prelims Exam and Mains Exam is updated below. Haryana HPSC BDPO Recruitment HCS Exam online applications are available from 02-08-2018 to 04-09-2018. HCS BDPO Prelims Exam will be held in Sep/Oct-2018. 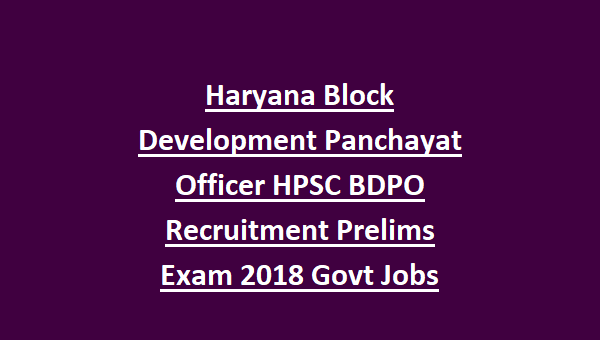 Haryana HPSC BDPO Recruitment HCS Prelims Exam 2018 Notification available vacancies, exam pattern and syllabus, online application form and other details are given below. There is only 19 BDPO vacancies in this HPSC Recruitment Exam 2018. Degree qualified candidates only eligible for these Block Development Panchayat Officer jobs. As on 01-01-2018 age limits for general candidates is 21-42 years for this HPSC BDPO Recruitment. For others age limits are 21-47 years. Haryana Block Development Panchayat Officers jobs selection is based on written exam of two stage and interview. HPSC BDPO Prelims Exam will be conducted for 200 marks. Exam Pattern and Syllabus will be updated soon in detailed manner. Mains Exam Consists of 4 Papers. Mains Exam is Descriptive type. If you are interested in this HCS Exam for BDPO jobs then submit your application form online before the closing date of 04-09-2018. Official website for this HPSC HSC application for Block Development Panchayat Officer jobs is www.hpsconline.in. Exam Syllabus and Pattern, admit card available dates and other information is available in this website only. Admit card for HPSC BDPO Prelims Exam will be available 15 days before the exam date.